This article was written as a research report to prove to an engineer I know that there is nothing wrong with ACQ lumber so long as galvanized nails are used. I proved myself wrong. Stainless steel is the only acceptable fastener. Special thanks to the engineers at Simpson StrongTie. THIS IS NOT THE IMPRINT AFTER THE SCREW WAS REMOVED. THIS IS WHAT REMAINS OF THE SCREW. The second half of this article is complicated. It discusses chemical reactions between nails and a type of pressure-treated wood used in California shear walls called ACQ, an acronym for Alkaline Copper Quarternaryaluminim. In order to save you the tedium of reading this complicated material, I have listed the only things you need to know in four sentences that explain why one should always use borate pressure treated lumber. 1-Never use ACQ lumber in a shear wall. Not in the nails or the bolts. NEVER. If you do, you can kiss your shear wall good-bye in a matter of years unless you are prepared to use very expensive stainless steel nails. Instead, use borate pressure treated wood. 2-All pressure-treated lumber used in dry locations, which means it cannot be used on decks, especially for sill plates that the plywood is nailed to and the bolts go through, should ALWAYS be borate-treated lumber. 3-Save your money. Borate-treated lumber doesn’t need galvanized or stainless steel nails. 4-Water causes borates to dissolve, so don’t use borate lumber if it will get wet, such as decks. ACQ is for wet applications and stainless steel bolts and nails should always be used. If you use galvanized nails instead, you should be prepared for a lawsuit when your deck collapses. That is all you need to know. Follow this advice and your relatives will love you when your shear walls protect them. If you want to know more, read on, if you scroll down you will see some revealing photos. If a 5/8 inch diameter bolt can look like this after a few years you can imagine what a smaller diameter nail will look like over time. Borate pressure-treated lumber has none of the drawbacks of ACQ. It does not corrode nails or other steel, and is cheap if you can find it manufactured in any quantity. You don’t need to use galvanized or stainless steel nails. Borate is safe. Borates are found in laundry detergents, stain removers, all kinds of cleaning products, cosmetic creams placed directly on the skin, bath salts, and eye drops, and other household uses. I don’t think you would want to use skin cream made with didecyl- dimethyl-ammonium-chloride, one of the ingredients of ACQ. The chemicals in ACQ enable lumber enable it to resist decay and infestation from insects. The main active ingredient in ACQ is soluble copper, which is one of the most cost-effective wood preservatives available. Quaternary, normally truncated to Quat, is another biocide in the ACQ preservative and provides additional protection from fungi and insect attack that copper alone would not control. Alkaline simply means the pressure treated wood is alkaline as opposed to acidic. ACQ is made by injecting copper and quaternary aluminum into the wood under high pressure. It is common to see short incisions in the wood which are made to help the chemicals penetrate as deeply as possible. These incisions immediately identify the wood as being pressure-treated. There are 12 different types of pressure treated wood depending of the application. These vary from wood used in children’s furniture to wood that can be embedded in mud and used as a foundation. For our purposes, we are concerned with ACQ-B pressure treated lumber because it can be found in all labor yards in the San Francisco Bay Area. There are 3 varieties of ACQ in common usage, types B, C, and D. The copper in each of these varieties of ACQ causes corrosion to nails, though some to a greater degree than the others depending on three variables: the amount of copper injected into the wood, the chemical used to facilitate the injection process known as the carrier, (in the case of ACQ-B the carrier is ammonia), and the moisture content. Moisture is the conductor or medium that allows molecules in the nails to migrate to the copper that has been injected into the lumber. Unfortunately, these combinations can cause nails or other metal products touching the ACQ to corrode, especially when the ACQ quat has ammonia in it such as ACQ- B’s didecyldimethylammonium chloride. Obviously, corrosion can cause nails and performance of shear wall to degrade. ACQ-B uses an ammonia carrier exclusively with a chloride quat, ACQ- C uses ammonia and/or ethanolamine as its carrier with an alkyd-chloride quat, D uses the same quat as B but exclusively the ethanolamine carrier. Ammonia alone in a carrier causes the most corrosion. ACQ-B uses a highly corrosive ammonia-quate combination because it readily penetrates Douglas Fir lumber found in the western United States. Retention level is also a consideration. Retention level refers to the amount of chemical preservative that remains in the wood after pressure treatment. The higher the retention level, the greater the tendency to deteriorate. The amount retained is measured in Lbs per cubic foot (pcf). 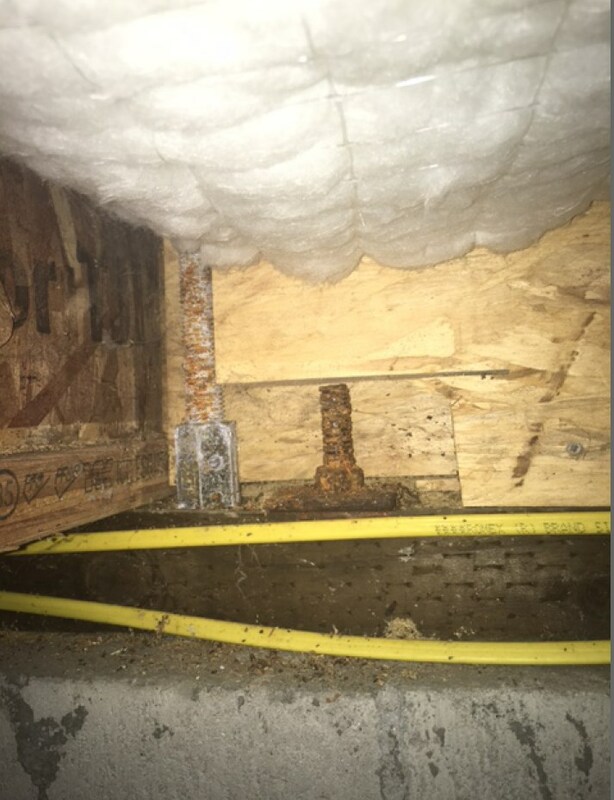 Besides the type of carrier and chemical retention, another factor is the presence of moisture in and around the ACQ lumber because galvanic corrosion can only occur when it has a conductor or electrolyte. Without this water electrolyte corrosion cannot occur. A water electrolyte is analogous to the water needed for a hair dryer to shock someone when it falls in the bath tub. When galvanized fasteners and ferrous metals are in contact with each other and these three variables are present with ACQ-B lumber, corrosion occurs. The higher the moisture level, such as with exterior decks, the faster the rate of galvanic corrosion. In those areas not exposed directly to water, relative humidity has a significant impact on this third variable because of its effect on moisture content. The higher the relative humidity, the higher the moisture content of the wood. According to the National Oceanic and Atmospheric Administration, the Bay Area has an average relative humidity of 84%, which is quite high. Douglas Fir lumber in existing buildings in the East Bay has a high moisture content, averaging 13%; in San Francisco it is even higher. This further exacerbates galvanic corrosion. 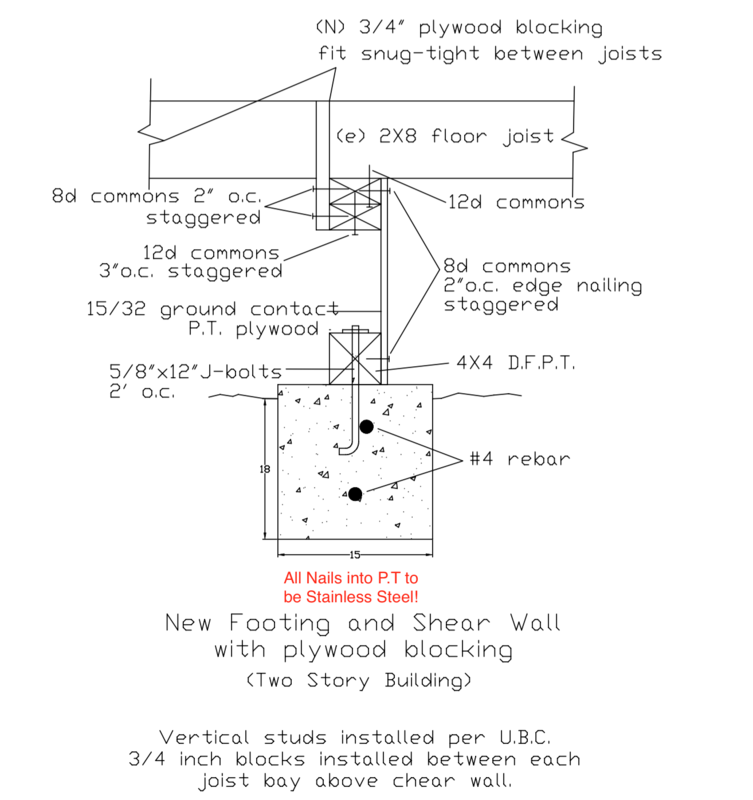 So which nail to use with ACQ-B lumber and plywood in retrofit shear walls? It depends on the carrier, the preservative retention level, and the moisture content. Various methods of combating this corrosion have been developed, the most common ones being the use of galvanized and stainless steel nails. In the table below, fasteners are rated in terms of their resistance to ACQ corrosion, from Low corrosion resistance to High resistance. The table is from Simpson StrongTie’s technical bulletin Barrier Membrane and Pressure Treated Wood which recommends types of fasteners to be used in pressure treated lumber. A barrier membrane is simply a metal coating such as zinc. According to footnote 1, not visible in this image, the column “Higher Chemical Content” refers to any type of ACQ lumber with a retention rate of 0.4 or greater. According to this table ACQ with a retention level of 0.4 or greater must therefore use stainless steel nails no matter what the environment. 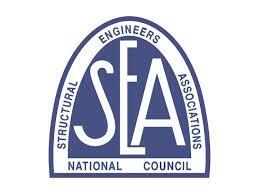 This includes virtually all of the ACQ lumber used for shear walls in the San Francisco Bay Area. Moisture content of the wood is reflected in the Environment column to the far left which in turn relates to relative humidity. The greater the relative humidity, the greater the tendency for nail corrosion. The only leeway can be found in the “ACQ with Ammonia” column, designated below with a green arrow. 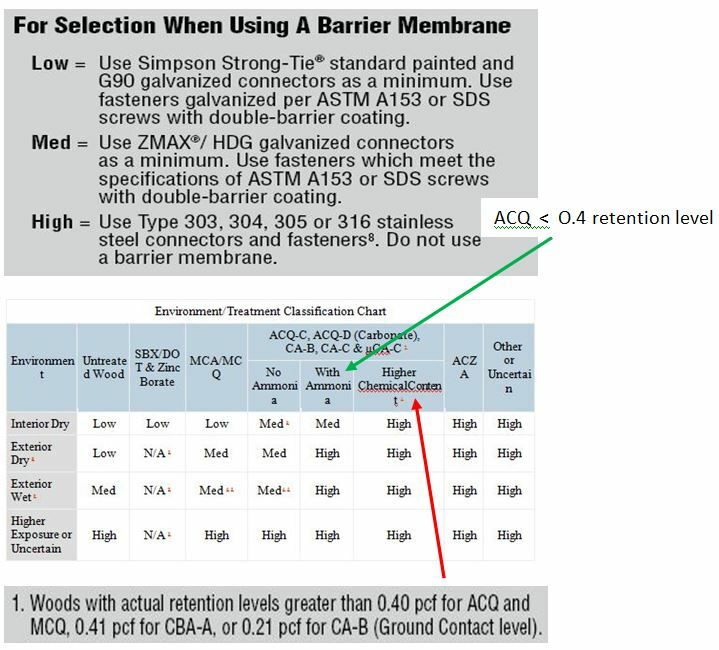 In this case Simpson’s ZMax double hot dipped galvanized nails are approved for ACQ lumber so long as the lumber is in an interior dry location and has a retention level < 0.4. 0.25 and 0.4 retention levels are the only two retention levels available in San Francisco Bay Area lumber yards, and 0.25 is hard to find. This means ALL shear walls built with ACQ lumber with an ammonia carrier and ammonia quat, no matter what the moisture and retention levels, should use stainless steel nails with the single exception of 0.25 ACQ used in an interior dry location. 2-Stainless steel nails should be used when ammonia is present. 3-The Bay Area has high relative humidity. 5-High relative humidity and ammonia promote corrosion of galvanized nails. 6-To avoid corrosion, stainless steel nails should be used in retrofit shear walls built with ACQ lumber. 7-Galvanized nails can be used in lumber with a retention level of 0.25 in a dry interior environment (like in a kitchen). 9-Even when built in interior environments, they still need stainless steel nails. 10-Shear wall using pressure treated plywood should always use stainless steel nails. After calling a few Bay Area lumber yards, I discovered that very few of them sold stainless steel fasteners suitable for shear wall construction except as a special order item. This is apparently because for many years after ACQ-B was introduced, the only recommendation by the pressure treating industry was to use galvanized nails. This in turn influenced the Building Code to do the same. Section 2304.9.5 of the 2001 and 2007 California Building Codes sums up their recommendation in one sentence. This code section does not recognize other variables such as environment, retention, or carrier. This means galvanized nails, which will almost always be the fastener of choice because of price, have been used in shear walls with ACQ-B pressure treated lumber on virtually every house built from 2004 until the present. In short, there is a very high likelihood shear walls built after 2004 will have a very high failure rate in the next big earthquake due to nail corrosion. The use of galvanized nails has and will unfortunately undermine the life and safety of many people relying on shear walls to protect them. The photos below come from that report. These galvanized fasteners were found to be in this condition after being used in exterior applications for 3 years. I have taken the liberty to redact those portions of this Research Report that do not apply to shear walls in the San Francisco Bay Area. “ACQ (alkaline copper quaternary) and CuAz (copper azole) water-borne preservatives are an acceptable treatment of exterior-grade timbers. However, their use necessitates achieving a significantly higher retained copper concentration than other pressure treated wood. Simple electrochemistry suggests timbers containing a higher water-soluble copper concentration are more likely to initiate serious corrosion of susceptible metallic components embedded or in contact with these timbers. Previous laboratory-scale, accelerated tests conducted by BRANZ and other research institutes confirmed the potential for an increased corrosion risk for mild steel and galvanised steel with CuAz and, particularly, ACQ treated timbers. “This research investigated the corrosion performance of fasteners made from mild steel, galvanized (zinc) steel and stainless steel inserted into Pinus radiata treated ground contact ACQ using a three-year, non-accelerated field exposure testing scheme at two sites in Wellington, New Zealand. 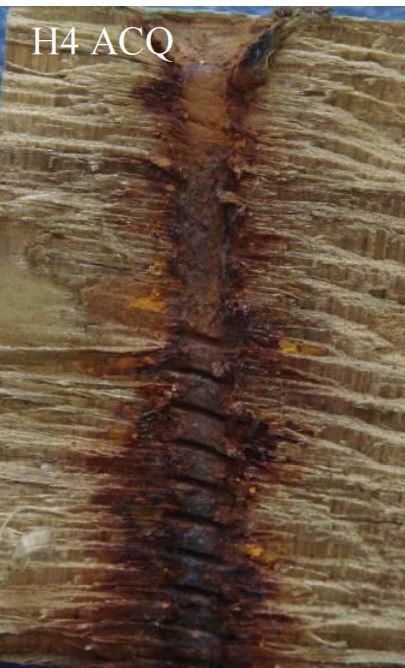 The ACQ resulted in severe corrosion of mild steel and zinc-coated fasteners, leading to heavy iron stain on the timber after only three years. This also made the retrieval of fasteners, particularly screws, difficult. This causes a significant loss of strength and structural integrity. “Nail sickness” is a term which has long been used to describe this phenomenon. The higher copper retention in ACQ and CuAz treatment is believed to be responsible for this significantly increased corrosive attack. However it is unlikely to be the only mechanism operating. It was also noted that timbers treated with ACQ or CuAz had a higher moisture content than those treated with CCA under identical exposure conditions. These two differences may also affect metal deterioration to some extent. Atmospheric corrosivity of a geological environment affects fastener corrosion. At Oteranga Bay, a severe marine environment represented a harsher atmosphere than Judgeford. The exposed section of the fastener was attacked more quickly, leading to higher corrosion rates, thus shorter service life. It is expected that within longer exposures, the influences of different climatic conditions on fastener performance will be demonstrated markedly since the decayed timbers will provide more pathways for ingress of airborne pollutants that can accelerate corrosion on the embedded sections. It is quite certain that long-term durability cannot be achieved for mild steel and galvanised steel fasteners when inserted into these timbers as the extremely fast corrosion in the initial stage of exposure will severely damage the integrity of the coating and attack the underlying steel substrate. Performance of the exposed head and the embedded body of a galvanised (zinc) fastener can be quite different, especially when it is embedded into ACQ or CuAz treated timbers exposed to a relatively benign climate such as Judgeford. After three years of exposure, the coating on the head of some nails still appeared to be fine, although surface oxidation was observed, while the coating on their shaft had been seriously damaged. This large performance difference between the head and the shaft makes the identification of any premature failure of fastener and/or timber joint very difficult. Stainless steel nails and screws did not show any sign of significant deterioration on their body section when embedded into CCA, CuAz and ACQ treated timbers even after three years of exposure at Oteranga Bay. Based on this study, it is doubtful that zinc-coated fasteners, including hot dip galvanised nails and mechanically-plated screws, will be able to meet the New Zealand Building Code The use of either AISI 304/316 grade of stainless steel, or durable equivalents such as silicon bronze, for structural components and connections would appear to be justified.